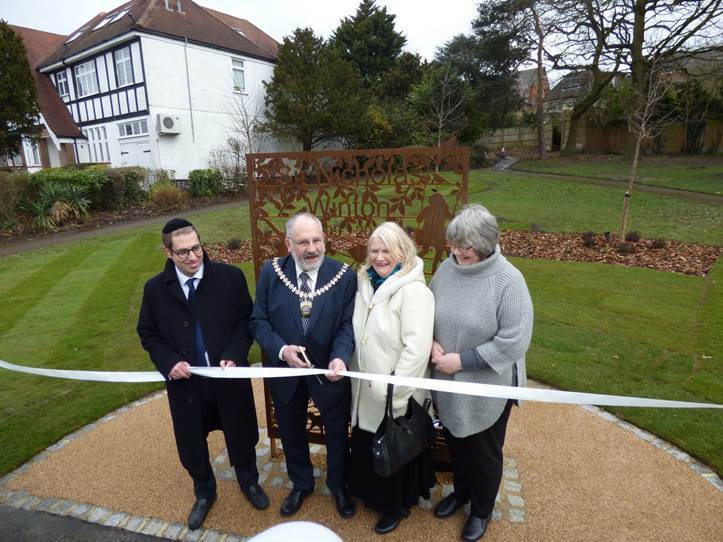 Councillor Dean Cohen; Mayor of Barnet, Councillor Brian Salinger; Mayoress Kate Salinger and Mrs Jill Blonsky from the Raoul Wallenberg Foundation. 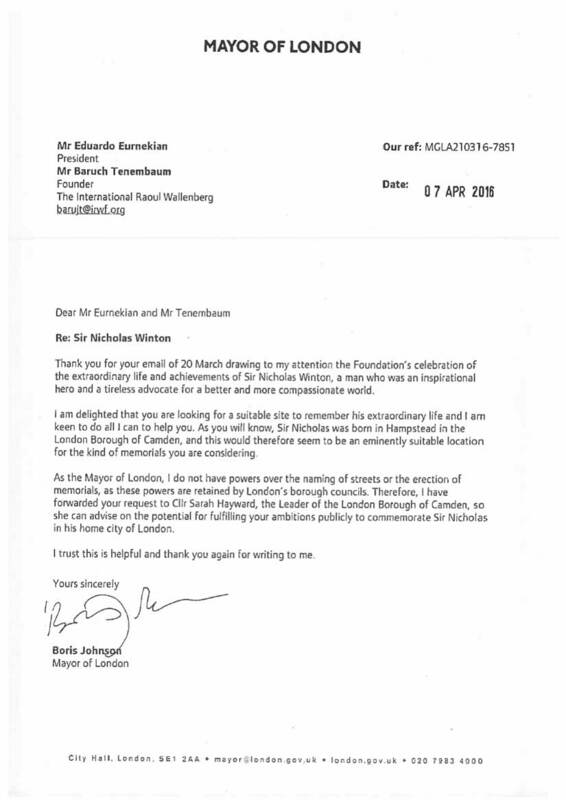 Following a call made by the Raoul Wallenberg Foundation back in 2016, to then Major of London, Boris Johnson and then to his successor and incumbent Mayor, Mr. Sadiq Khan (read below), the Mayor of Barnet, Councillor Brian Salinger, and Councillor Dean Cohen, took part in a ribbon-cutting ceremony on Tuesday, 13 March 2018 to open a memorial garden for Sir Nicholas Winton (1909-2015) at Princess Park, Golders Green. The Raoul Wallenberg Foundation was represented by Ms. Jill Blonsky, a UK member of the educational NGO. Sir Nicholas Winton was responsible for the saving of 669 Czechoslovakian children in the eve of WWII, ferrying them to UK, where he found for them fostering homes. Back in June 2013, the Raoul Wallenberg Foundation bestowed upon Sir Nicholas Winton the Raoul Wallenberg Medal, in recognition of his remarkable life-saving efforts. 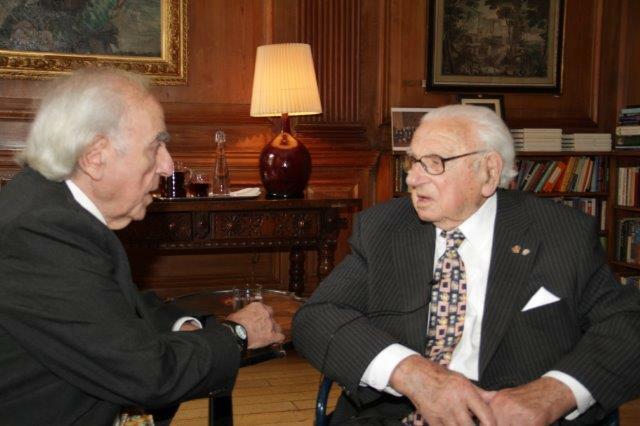 Sir Nicholas Winton and Eduardo Eurnekian. 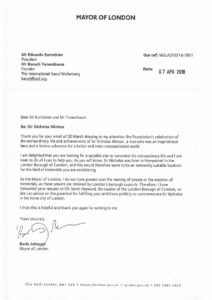 Mr. Eduardo Eurnekian and Mr. Baruch Tenembaum, Chairman and Founder of the Wallenberg Foundation respectively, have reacted to the news, stating that “Sir Nicholas Winton was one of the greatest heroes of the Holocaust. We are proud that our initiative to name a public place in London after him has been welcome by the local city authorities, and we thank the City of London for this well-deserved gesture to one of her most prominent sons”. A number of primary schoolchildren and their teachers attended the ceremony. The children had been briefed ahead of time regarding the history of Nicholas’s pre-wartime rescue mission. Baruch Tenembaum and Sir Nicholas Winton. The monument itself consists of a plaque placed on top of a plinth with information of Sir Nicholas’s rescue of 669 children. Adjacent to this plaque stands a monument built of a special type of steel which lends itself to water-jet carving. The initial colour of the monument will become more uniform in time but at present is of a gold colour. The carving shows the rescued children playing, and when the sun shines through it, a shadow in the shape of the children is cast on the grassland behind. In front of the plaque and the monument are two beautifully carved benches, also showing children playing. Two more are to be placed behind the monuments. It is hoped in the future, funds permitting, that a model train will be added to the area in honour of the train which transported the children to safety. The development officer of the project is very enthusiastic about the entire project. Behind the monuments is a carved area of pebbles which includes a number of plants including snowdrops, and crab trees. In summer the area will bloom and lend a beautiful backdrop to the memorial. The plan is to extend the entire area of the garden. The park itself is one of the most popular, especially for children, in the area. After a few short speeches, a ribbon was cut to open officially this are of the Park. Watch the video. 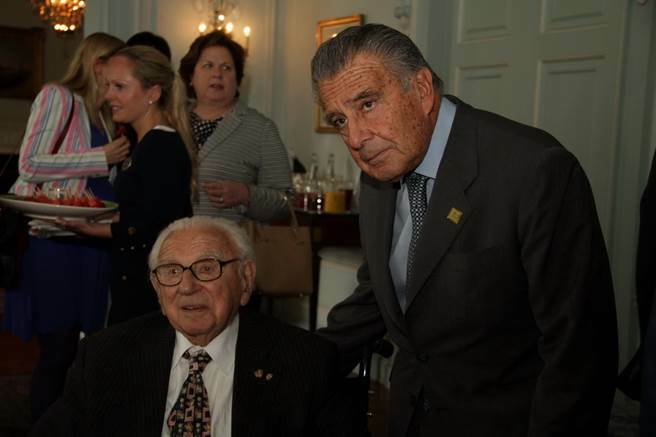 Sir Nicholas Winton interviewed by the Raoul Wallenberg Foundation in 2013. We are very pleased to address you on behalf of the International Raoul Wallenberg Foundation (IRWF). At the outset, we were delighted to read on the Jewish News your kind and warm words of support to the call we made to the incumbent Mayor, Mr. Boris Johnson, to name a street or public place after Sir Nicholas Winton. Needless to say, your backing, as Member of the Parliament and as candidate to the post of Mayor of the City of London, is a source of inspiration for us. The IRWF is a global-reach NGO based in New York, with representative offices in Berlin, Tel Aviv and Buenos Aires. Among our Honorary Members are more than 300 Heads of State and Government (former and incumbent), Nobel Prize laureates and distinguished personalities from all nationalities, walks of life and religions, including Pope Francis, who joined our ranks when he served as Archbishop of Buenos Aires. Our key mission is to preserve and spread around the courageous legacy of Raoul Wallenberg and his likes, namely the women and men who reached-out to the victims of the Holocaust as well as other tragic chapters of human history. Our flagship projects nowadays are the Houses of Life and the research on the Muslims (Turks and Kurds) who reached-out to the Armenians in 1915, during their tragic persecution. In fact, we deal with rescuers not only of the Shoah but also from other bloody chapters of human history. The Houses of Life initiative is aimed at identifying and marking physical sites in Europe that gave shelter to innocent victims of Nazism, mainly children who were left by their parents before the latter were being deported to the concentration camps. So far, we have located more than 300 Houses of Life in various countries of Europe and the numbers are growing by the day. The great British hero, Sir Nicholas Winton has always been close the hearts of those who cherish the spirit of the rescuers. It is not surprising therefore that the IRWF has paid tribute to Sir Nicholas in a number of occasions and forms. Back in 2008, we commissioned from the Israel Postal Authority a commemorative stamp issue bearing his semblance (please see below). On June 27, 2013, when Sir Nicholas was 104 years old, a special delegation of the IRWF, us included, specially flew to London to meet with him and bestow upon him the Raoul Wallenberg Medal. This gave us an opportunity to have a lively chat with this humble hero, who preferred not to talk about his past feats but to concentrate on how to work for a better world. His unique sense of humor and remarkable wisdom, left a magnificent impression upon us. As you probably know, next May 19th, Sir Nicholas’s daughter and son shall be holding a Memorial Service dedicated to their father, in London. We are privileged to have been invited and we are planning to send over a special delegation from our Foundation. As you could learn from our letter to Mayor Johnson, our Board has resolved a series of activities and initiatives aimed to further recognizing the feats of this remarkable human being. One of them, which shall be announced shortly is the idea of erecting a commemorative bust of Sir Nicholas which of course would be emplaced in a symbolic venue, related to his humanitarian deeds. The other proposal is to name a London street and/or public place after Sir Nicholas Winton. Regardless of the results of the upcoming mayoral elections, we would be delighted to hearing from you your suggestions and ideas and we shall be honored to cooperate with you in these or other projects aimed at highlighting the figures of Sir Nicholas in particular and the Rescuers in general. Once again, thank you much for your kind support.